We've seen some tiny studios before, but this one is moving into the lead to become one of the smallest fully-functional homes in the pack. Now, my Russian is a little rusty (that is, nonexistent), but this studio was found on StyleRoom, the website of Russian architect and designer Pavel Vasin (Note: thanks for finding his name, Irina!). Still, it's interesting to analyze this floor plan. The "wet" rooms (kitchen and bathroom) are on the left, with a tiled floor. The "dry" living and sleeping spaces are on the right. There don't appear to be many overly clever tricks for furniture and storage (no transforming tables and the like), with the exception of the swiveling TV that allows viewing from either the living room or the bed. Instead, everything's just teeny-tiny. I think I'd be able to live in a place this small, but it would definitely need some work. It's not very homey as it is -- but then again, that makes it all the easier to make your own mark. I've found out his name - Pavel Vasin. It was hidden in credits for images. Thank you so much! I was looking and looking for it, but I couldn't find it. I know! Everything you need is in that tiny room -- and it looks like there's lots of room for adding personality too! 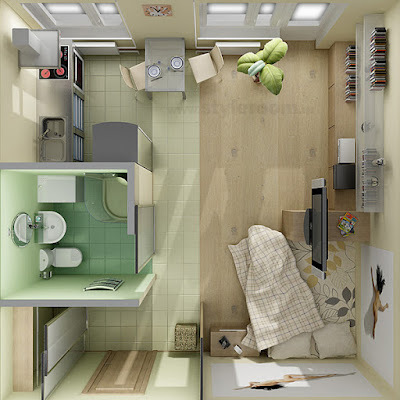 Wow, this reminds me of the compact apartments in NYC! Like the overhead view.